Lodge Creek Longhorns is located in north central Montana, approximately 25 miles north of Havre. We are conveniently situated within miles from the Canadian Border. LCL pledges to provide you with the best bloodlines from our herd to yours. We are striving to breed the perfect producing cow like many of you. We see the importance of keeping twist within the Longhorn breed and will continue to work towards the perfect conformation carrying a healthy TTT with twist. We are very proud of our herd and you will notice there is a side profile pic of every animal here at LCL. Reier and Betsy Torgerson (great-grandparents) established the first store in Ethridge, Montana in 1912. Their son, Lloyd, worked at the store with them and took over the business in the late thirties. The store operated as a mercantile, sold appliances, trucks and even airplanes until the sixties, when it became a pure farm implement dealer. Lloyd and his wife, Gene, turned over the business to their three sons in the seventies, who ran the business as a partnership until two of the boys sold their shares to their brother, Eric. Eric now runs the business with his three sons; Brion, Aron, and Lin. Though they all have different roles in the business, all decisions are made as a family. Torgerson's has grown to into a 4th generation farm implement dealer with 8 locations throughout Montana. In addition, we operate a family farm in Ethridge, Montana. Our legacy is based on strong family values and building something solid and substantial. We believe that our employees are the strength of our company and appreciate their dedication to the business. 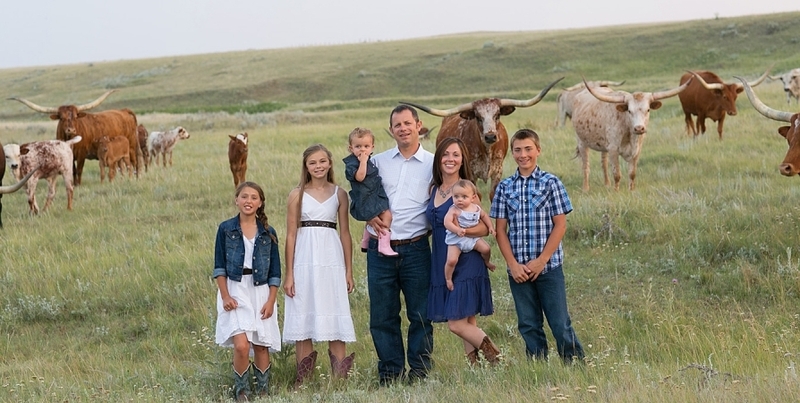 The love of farming, the land, family, and community is a lifestyle for the Torgerson's. This passion is what keeps the family business growing despite the constant changes in the agricultural industry. Although, our family is known for farming, ranching has become a passion. Our family is comprised of 4th generation farmers. It was no surprise to anyone in our family that someday, someone may try something a little different; After all, diversity has kept us growing for over 100 years and steadily growing. (steady as we grow!) Lin Torgerson was the man to do that! His passion for animals increased the moment he purchased his first longhorn. Lin always dreamed of having a few Longhorns around the farm merely as "pets". His dream became reality in 2010 and so began our journey with Longhorns. Our first cows were purchased in Montana but several hours away from home. Since that first purchase, our herd has increased to 35 and is continually growing. We along with our 5 children truly enjoy raising Texas Longhorns. Our hope is to share our love and passion of this cow breed with everyone we possibly can. Longhorns will forever be a part of our family heritage. We'd love for them to be a part of yours as well. We encourage you to look around our website and contact us with any questions you may have.